Where I am heading for the next 4 weeks. Into this little journal via Thought Threads. I am the world's worst journaler - I even have trouble typing the word. That doesn't keep me from buying journals - I have drawers of them, all sizes - so when one of the requirements for the course was a small-ish journal that I could keep with me (spoken by someone who has never seen the giant tote/purse I carry everywhere), I, of course, wanted to buy a new one. It was perfect timing - I've been thinking about getting a new address book, and agonizing over that, agonizing over whether it was okay to put away the address book of my last 35 years, beautiful little brown suede thing, a companion really, and make a new beginning with a new address book, full of people I actually keep in touch with instead of people from my past. So off I went, my head full of address books and journals, and I oohed and aaahed over lovely leather things and cute little moleskins and even ecologically correct journals - which I admit made me just roll my eyes and laugh, because their target demographic is definitely not people with a limited income. And came home empty handed. Just couldn't do it. The address book I am still thinking about - I think psychologically it is the thing to do, but I just didn't see anything I liked; blue is apparently not an "in" color right now. And the journal? Well, I spent my money on a book or two instead, and decided I'd just use one of the journals I already had, which is truly more ecologically sound, if you care about such things, which, again, I admit, I don't, and that's all I will say about it - you all already know that about me and I don't want to get into politics. Except that the ecologically correct journals & calendars & dayplanners & address books reminded me of signs that say "Simplify", like one that one of my friends has hanging outside next to her patio. I mean, if you really want to simplify, wouldn't it make much more sense to just not buy or hang the sign in the first place? So anyway. I will be journaling in this sweet little journal above, which really only measures about 5"x7" at the most, and has a pocket in the front for a picture. I shoved in the stamped eyes to take this picture - they were laying around in my pile of stuff to collage with - and they may stay. We will see. Right now it is sitting in a Ziploc bag with pens, so I can carry it with me always, waiting for my 1st assignment. Who knows what this will open? I may need a life preserver. i can imagine your journal will be something worthy of publishing. have all of the above ready at hand in your gargantuan handbag that is surely NOT ecologically valuable in any way. Debi, I'm returning the favour by checking out your blog - I love it! This entry about your journal strikes several chords with me. I too have a bunch of empty books waiting to be written in but ended up choosing a very small one I got at the dollar store a couple of weeks ago. I shall enjoy sampling your previous blog postings, my initial taste has been most enjoyable! The online course I am currently taking is about making unabashed art...layering, collaging, etc. I have yet to jump in and get my hands slimy. I could claim I'm too busy right now, but the truth is, I believe the class will make my damn burst and I have no life preserver. Would you mind sharing yours? Or maybe, at least, pass the Dramamine? Happy Journaling Voyage to you! Wait! Where are you going? Somewhere else for four weeks? Was I asleep at the wheel? Oh, well. No, I am the WORST journaler! I have many almost empty journals save for a few unfinished pages to prove it! I've spent way too much money on buying journals. I can't seem to help myself. I finally admitted, though that I'm no good at it in spite of repeated and failed attempts. Back to the 'trip'. If you're off to go somewhere, have a good journey. And have a great Thanksgiving! 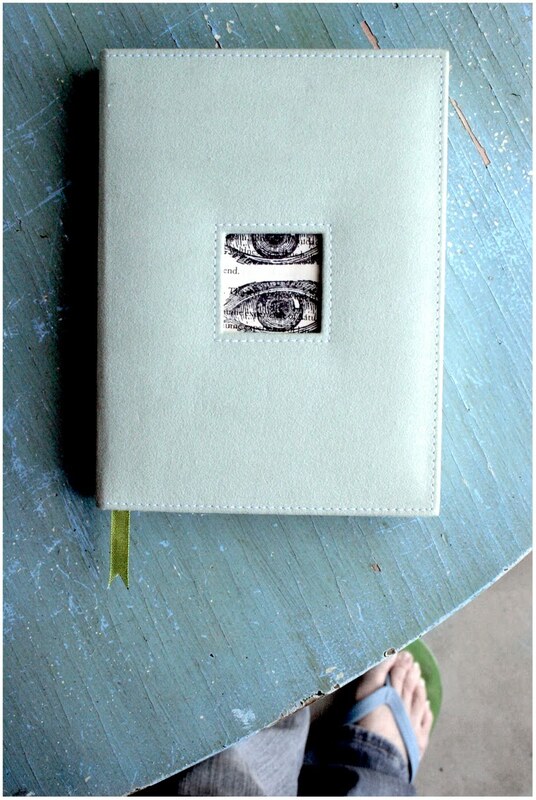 I call myself a journal whore...I buy them...make them, hoard them....and am also a terrible journaler. only to start again, in a new journal, months later. I'm so excited that you are doing this. I am eager to hear how it goes and what you think of it. Keep us posted won't you? And I am the worst at keeping up with them. But I broke down and finally picked up that *Wreck this Journal* journal by Keri Smith, and let me tell you..it is so much fun to do the opposite to this one..I get to scribble and rip pages out and colour pretty things if I want and fill it with junk and OH it is so liberating! I needed a creative kick in the pants. Best of luck on this new journey of yours. May the journal BECOME your life preserver. btw...I so adore these photos of your cute little feet!